Giorgos Haskas fills the seams between the wooden planks making up the deck of a "boti". 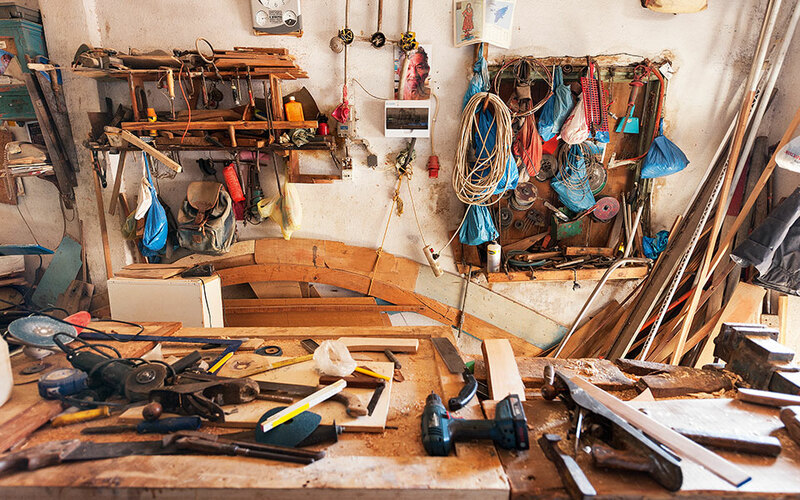 In their boatyard on Symi, the Haska brothers keep the millennia-old tradition of building wooden boats by hand alive. 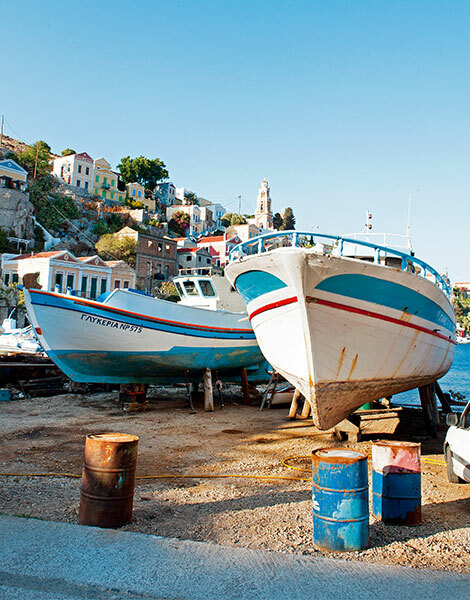 The boatyard of the Haskas brothers in Pedi on the island of Symi is one of the few remaining traditional boatyards in the country. On the day that I visited them, towards the end of the summer, by coincidence they were making an addition to a boti (a type of small wooden fishing boat), the construction of which I had photographed a few years earlier in June of 2012. 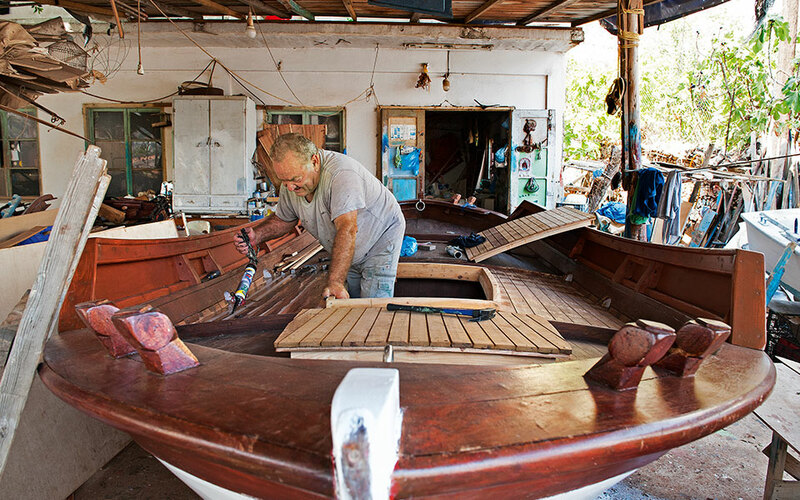 I ask the boatbuilder Giorgos Haskas to talk to me about his craft, and he begins telling me a beautiful life story. “We are three sons in the family. 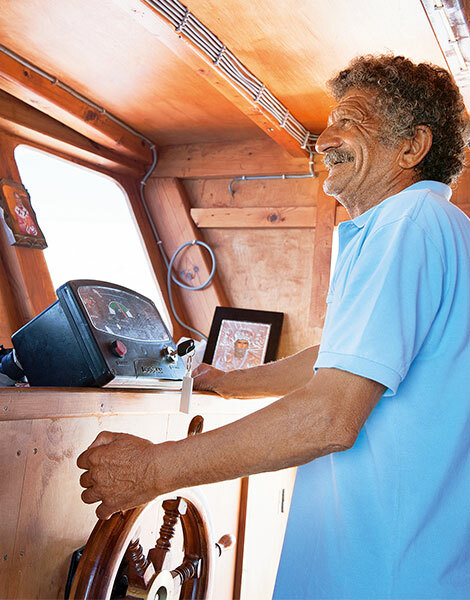 The firstborn is myself, born in 1942, then there’s Panormitis, who is the best craftsman out of all of us, and the third is Apostolis.” Their father, Ilias, who passed away in 2001 at the age of 88, also left his mark in the world of boatbuilders in the Aegean. Apostolis Haskas' taverna in Pedi. He strokes the boti from 2012 that has come for an addition. It belongs to Andreas Chatzis, an architect from Rhodes. “I only went to elementary school,” he continues. “In 1965 I married and left with my wife to go to Zaire, where my in-laws had a business. There I also made an 18-meter caique. Business was good but in 1974 we abandoned everything and left because of the political situation there. And so I got back into boatbuilding, despite the fact that my knowhow had suffered over the ten years I had been away. The taverna, with its little tables on the water’s edge is one of those island haunts that are slowly disappearing. It was started as a traditional kafeneion (coffeehouse/eatery) by their father in the 1950s – it catered then for the boatbuilders, putting out the odd meze. 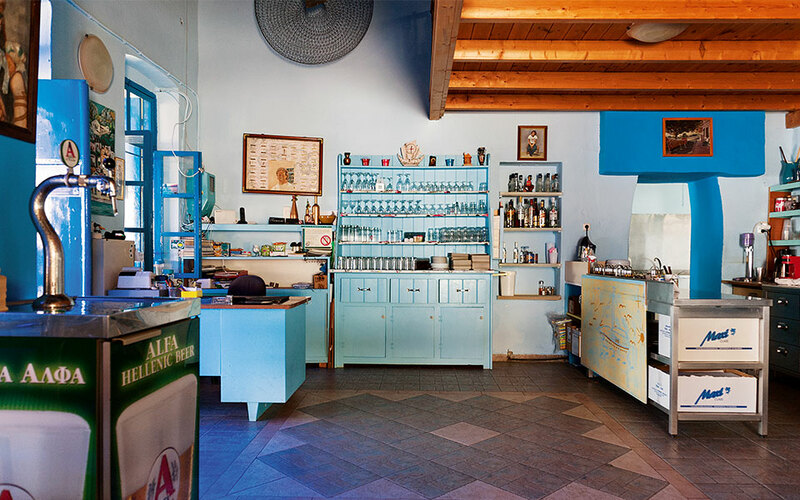 In 1987 the then young Apostolis decided to refurbish it and turn it into a taverna. Today it is one of the most authentic on the island. Locals, as well as visitors from France, Italy and Turkey enjoy seasonal Greek dishes to the sound of the waves lapping and with a view of the elegant neoclassical buildings that surround the bay of Pedi, built almost to the water’s edge. Traditional boats in a drydock in Yialos. Among them is Glykeria, which was slated for destruction. Panormitis, who at the age of 70 still practices the art of building wooden caiques with enthusiasm, arrives in a rowboat. “When he is not building boats, he is in one,” his brother Apostolis quips. “The day before yesterday we relaunched the “Maria” which you had photographed in 2012,” he says. Maria is a brilliant white caique that takes visitors on day trips to the beaches of Symi and the islet of Nimos. Its captain is Panormitis Kritikos, who is assisted by his son Petros, while his daughter Victoria has the role of advertising the trips on the internet and issuing tickets: they have a kiosk in Yialos. Their father helps everywhere, while their mother makes fantastic dishes, such as the chicken and rice casserole and Symian cheese pies that, together with fruit and raki, are included in the price of the excursions. I ask him what sets “Maria” apart from fiberglass caiques. “The wooden hull is more seaworthy, faster, more beautiful and is superior in resilience and safety.” And the cost? “The woodworking costs do not run higher than 50,000 euros,” he says. The next day, Giorgos Haskas is very forlorn. “On Monday they will break up ‘Glykeria’ one of our caiques from 2001,” he explains. Many fishermen destroy their boats in order to obtain the compensation offered by the EU in the framework of its policy aimed at combating overfishing. In Harani, the other boatyard on Symi, “Glykeria” together with another boat are awaiting their final hour. With the destruction of his vessel and the relinquishing of his fishing license, an owner-fishermen will receive 80,000 euros and can buy a new fiberglass boat in order to be able to travel to more remote areas to fish. How he will obtain a new license is a question. So too is why for so many years thousands of irreplaceable traditional vessels – unique examples of the craftsmanship of Greek boatbuilders – have been destroyed when the state could simply alter their classification (i.e. reclassify them as recreational as opposed to fishing vessels) to allow them to be preserved. The Symians were always fishermen, sponge divers and incomparable boatbuilders. Their beautiful vessels were described by Ottoman chroniclers as “flying ships that cause losses and damages”. Let us hope that tourism can offer a breath of life to the boatyards, and that a new generation will want to learn wooden boatbuilding, that ancient Greek art.